Japanese Episode AG 047: "Eneko to Aroma Terapii!" American Episode 319: "I Feel Skitty!" Haruka is busy training for her upcoming Pokemon Contest when she comes across an Eneko! Haruka is instantly taken by Eneko's charm and decides that she has to capture it! However, Eneko doesn't seem to be feeling so well! Takeshi is reminded of an Aroma Therapy Laboratory in the area that's famous for revitalizing tired pokemon, and so he convinces Haruka to take the pokemon there. When the gang arrives, they are greeted by the woman in charge of the laboratory, Arissa. As Arissa heals Eneko with an alluring scent, the Rocket-Dan plot to steal all the potion to give to the Boss. The Rocket trio attacks, and in the process they nab Eneko as well as the mixtures they were after. As Haruka and the others try to retrieve the pokemon, Nyasu starts to fall for Eneko! Musashi wants to catch the pokemon for herself, but Nyasu opposes, thinking that being a member of their group would mean only trouble and pain for the little cat pokemon. Nyasu tries to hide the pokemon, but he isn't able to keep it up for long when Arissa has her Utsudon use Sweet Scent to lure all the pokemon in the area to her location. Once everyone gathers, a battle ensues, allowing Haruka to practice fighting with her Agehanto. Haruka's pokemon wins the battle, and the Rocket-Dan is sent blasting off. As Satoshi-tachi bid Arissa farewell, Eneko gets itself captured by Haruka! Now that Haruka has a new pokemon, the group is able to continue on their journey. My God I wanted to kill Masato in this episode. Haruka's brother does the "pull Takeshi away from a pretty girl" no less than four times in this episode. FOUR. Kasumi was annoying with it in Jouto, but she never took it to the extreme that Masato did in this episode. The episode itself was alright enough, but this horrible running gag just drug the episode's quality down greatly in my eyes. I guess the one silver lining in all this is that Kojirou's Sabonea didn't do its running gag (hugging Kojirou whenever it's released), making this probably the only episode in the series in which Sabonea doesn't even try to hug its trainer. Also, the return of Musashi's and Kojirou's Rose of Versailles outfits first seen in "Pokemon Fashion Flash" was really nice as well. Kojirou doesn't crossdress enough in Houen. Eneko keeps its Japanese voice. The first two seconds of the episode are cut. No surprise there. Brock: "Y'see, they use fragrances here to heal the pokemon. I saw an infomercial on it." Brock: "Wah! You must be Eliza the therapist! You're much more beautiful in person than on TV!" So tell me, 4Kids: When does Brock ever get the chance to sit down and watch TV? It's kind of hard to watch infomericals when you're constantly on the road, and I don't recall seeing any of the characters have the time to watch television except for Satoshi in the first episode of the first series. Originally, Takeshi knows everything that he does about Arissa's lab from a magazine article. Since, you know, it's a lot more feasible to be reading about somebody when you're traveling through some forest or the desert than it is to watch a TV program on them. 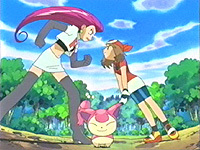 When Jessie does that Chun Li kick to Meowth (after he tells her that Skitty ran away), she does so two seconds longer in the Japanese version than she does in the dub. Two seconds are cut after the final commercial break. And, two seconds are cut from the TO BE CONTINUED... screen.